Bradman Scholarship | The International Cricket Hall of Fame. Download Scholarship Application 2019 here. The emphasis on choosing a Bradman Scholar is placed on a blend of academic, sporting (cricket), personal and social skills, all of which best allow the Scholar to fulfil the purpose of the Scholarship. An essential criteria is that the applicant is an Australian citizen. 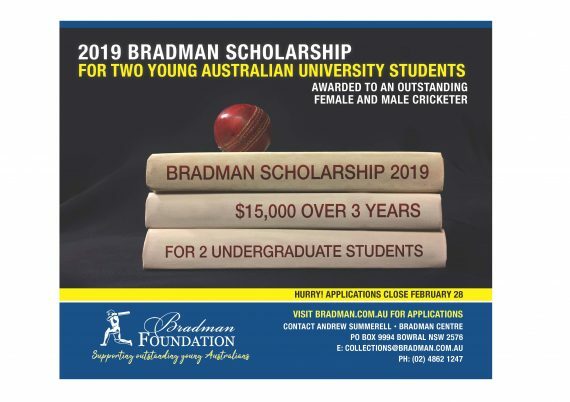 Over 25 years the Bradman Foundation, based at Bowral in New South Wales, has assisted many young cricketers with the costs associated with acquiring a tertiary education, juggling study and cricket club commitments. The Bradman Scholarship is national and was first awarded in 1990. It is open to all undergraduate students who have a connection with cricket and continue their involvement whilst at university. The Bradman Scholarship provides a three year funding plan of $5,000 per year for up to three years. Eligible participants must be players, qualified coaches or umpires, who are actively involved in the game and continue whilst attending an Australian University as an undergraduate on a full time basis. The primary condition for applicants is to have played, junior or school competitions and have a proven connection to club cricket. They must not have, or during the term of the scholarship, defer their education to focus on the Elite Pathway Program. The Bradman Scholarship has been in existence for 25 years and is highly regarded by recipients’ as a major contributor towards their corporate careers. Five females including current Australian Vice-Captain Alex Blackwell and Sydney Sixes Kara Sutherland are among the 22 recipients. The 2015 Bradman Scholar is Australian School Sport U/16 batsman Damon Kerr. The Bradman Foundation is not looking for purely academic achievers, the emphasis when choosing a Bradman Scholar is placed on a blend of academic, sporting, personal, social skills and community involvement. The Committee look for those who will benefit most by receiving the financial assistance provided by the scholarship. They equally look for students who have good character and leadership qualities, a solid record of sporting and academic accomplishments at school and hold an appreciation of cricket and its history. In addition they must demonstrate the character values which Sir Donald Bradman espoused in both word and deed. The successful Scholar will represent the Bradman Foundation, be of good personal presentation, possess an ability to communicate well both orally and in writing and demonstrate an active association with cricket. Proven involvement in community activities is beneficial and applicants should not hesitate to provide information on their involvement and interests outside of cricket. Information on recent (3 years) accredited courses, achievements and voluntary roles undertaken may be taken into consideration by the committee when comparing applications. Additional information is contained with the application documents which can be down loaded from our website or email [email protected]om.au and request the package be emailed directly.